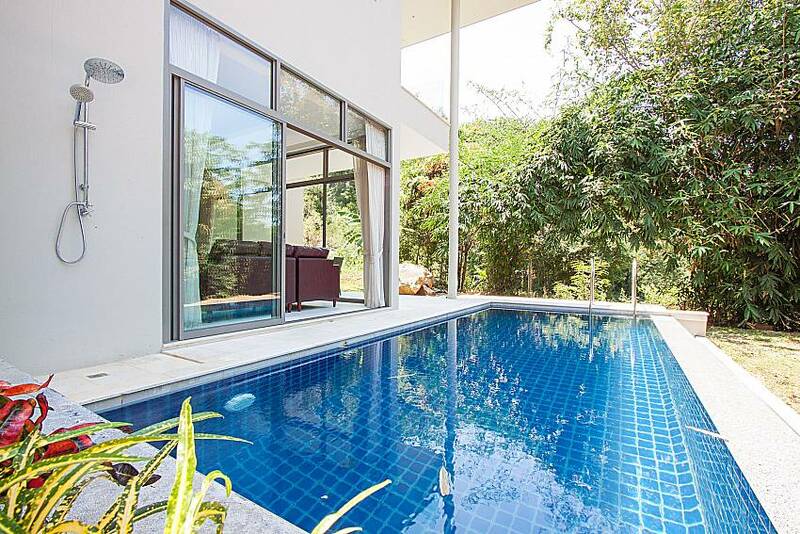 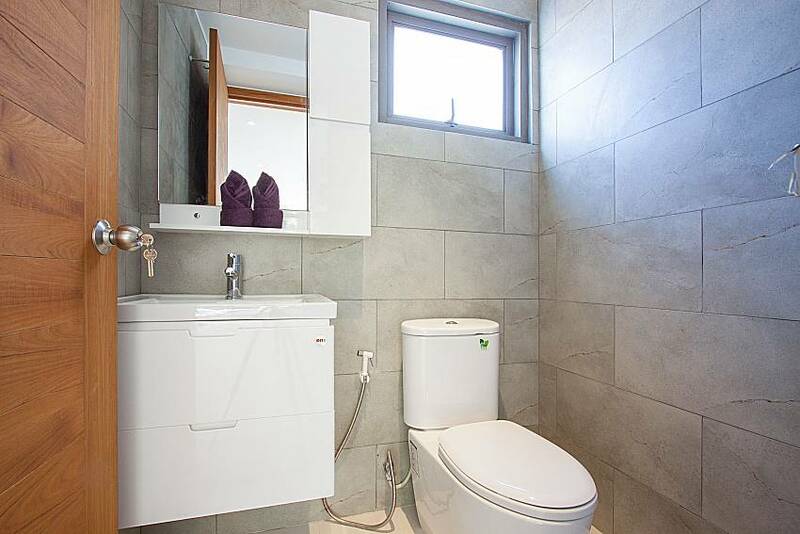 Located in a private countryside setting amidst luscious vegetation, this modern 2-bedroom semi-detached villa sleeps 4 and comes with a private swimming pool at Maenam. 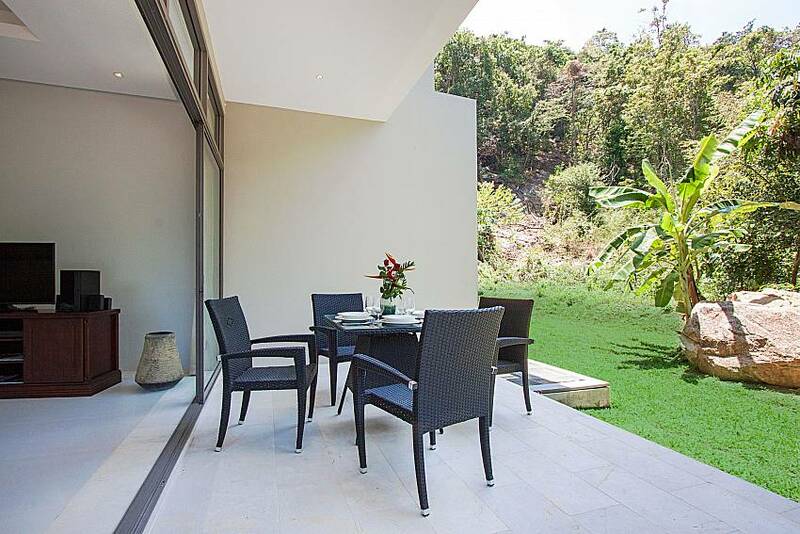 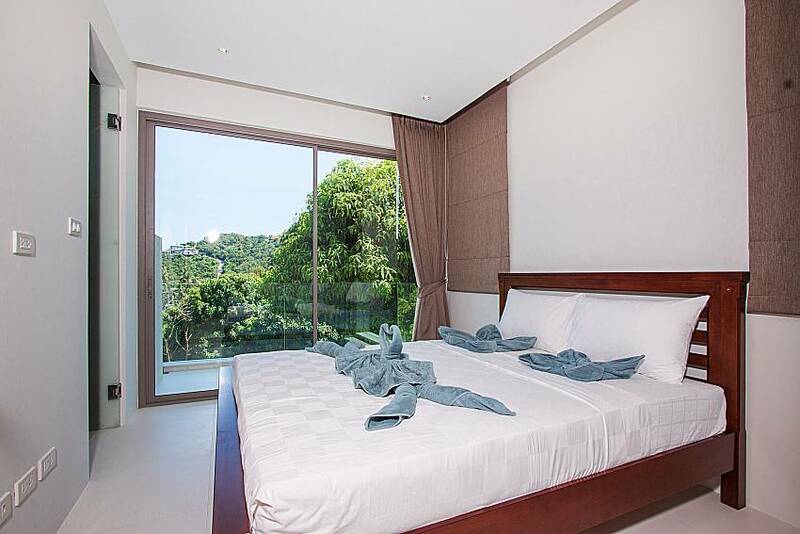 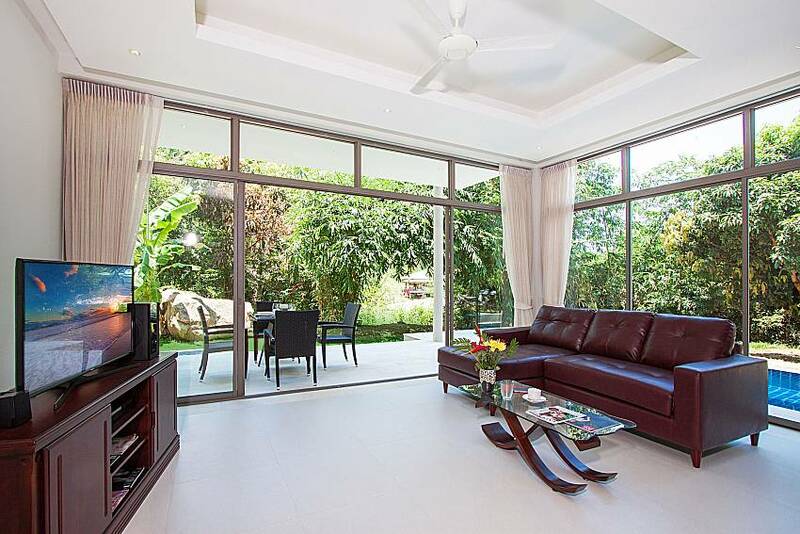 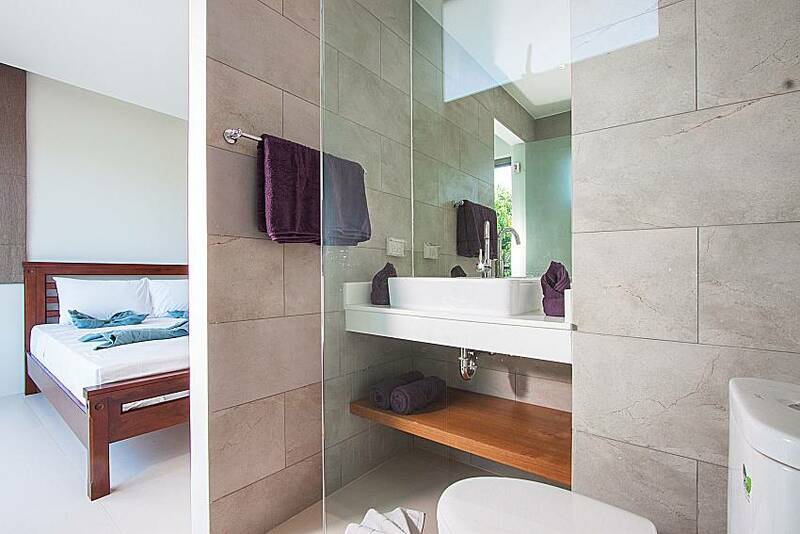 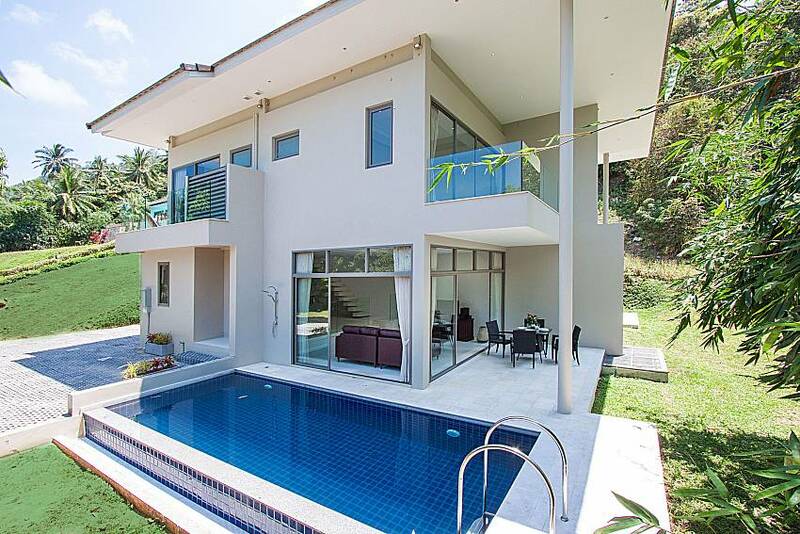 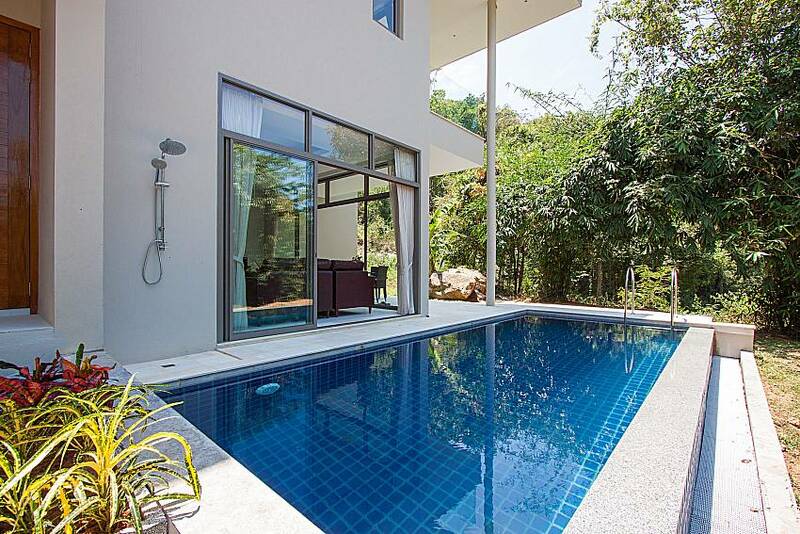 Located on the north coast of Koh Samui, just 1.5km from Maenam Beach, we have this chic and modern 2-bedroom semi-detached villa, set within a very private environment surrounded by stunning jungle terrain. 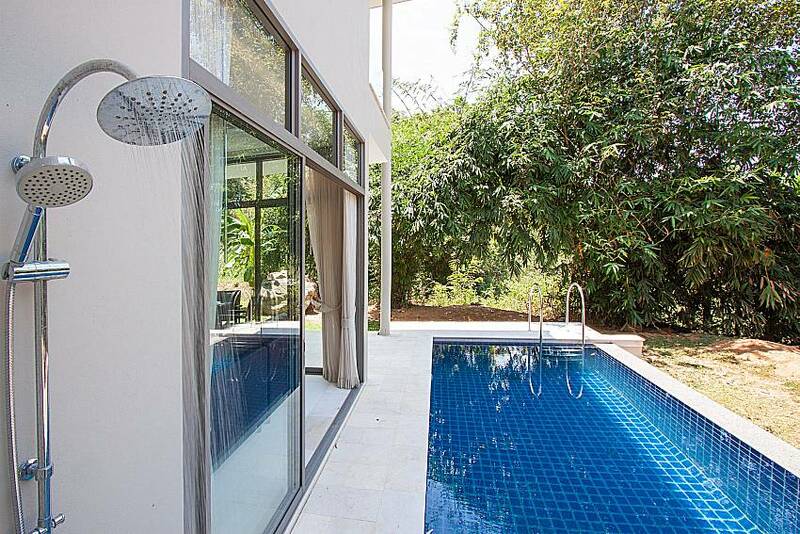 This modern villa merges indoor and outdoor spaces to create something new, stylish and unique. 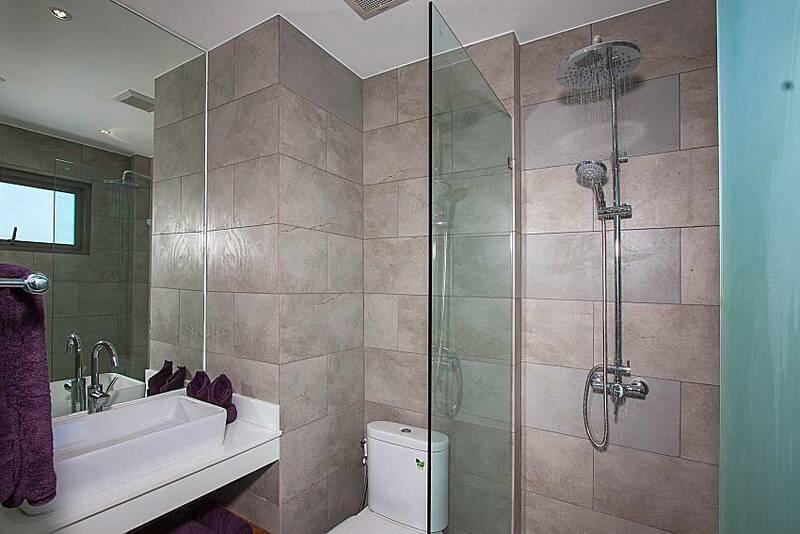 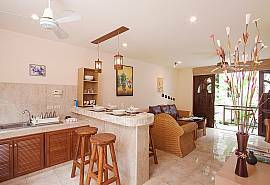 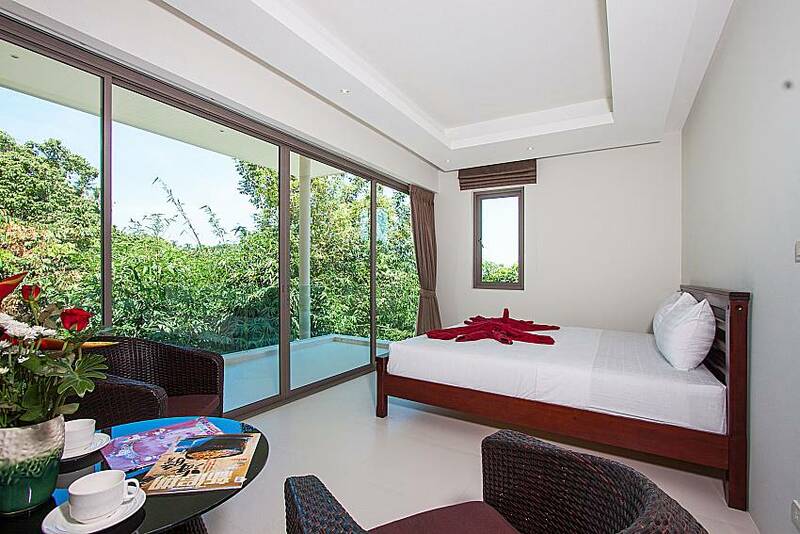 You can rent the 2 villas together, sleeping 8 persons. 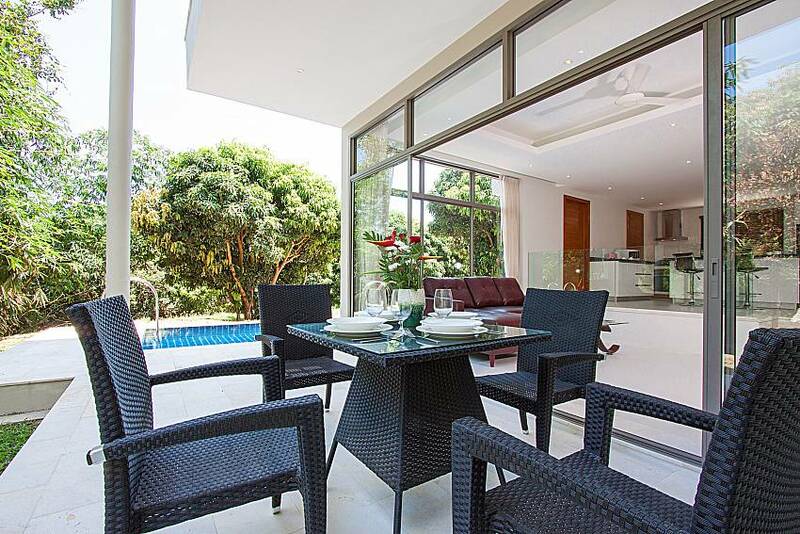 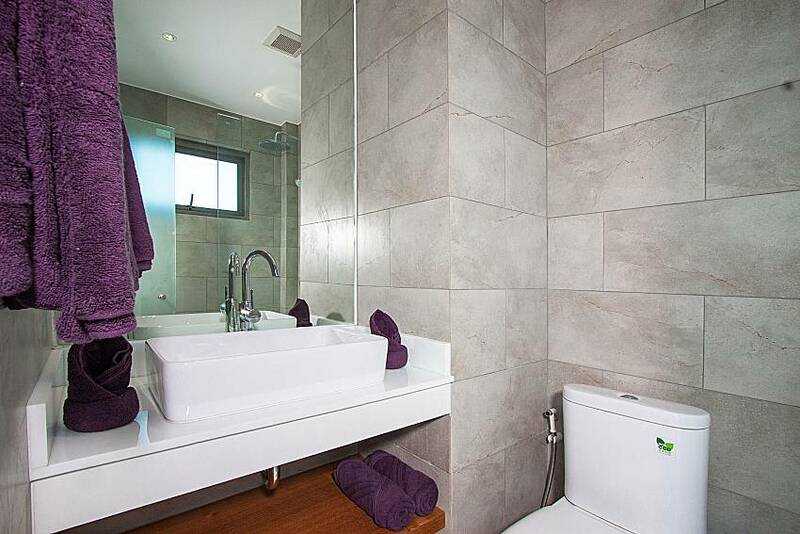 Set over 2-levels, you will find a private swimming pool and an adjoining covered terrace with a table and chairs, leading directly into the lounge through tall floor-to-ceiling windows that give the house a real open feel. 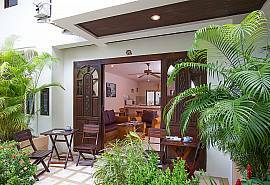 The lounge enjoys pristine white walls and tiled floors, giving the property a contemporary flavor. 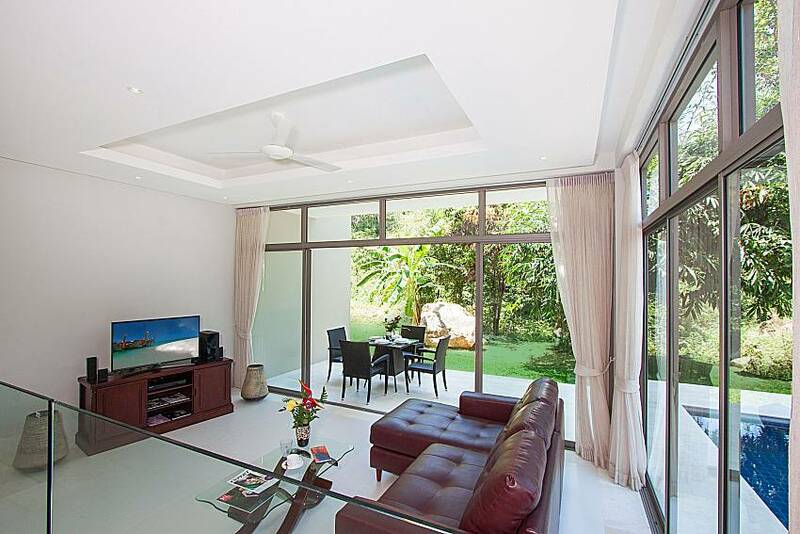 The lounge is home to an L-shape leather sofa and a flat-screen TV with a choice of international channels. 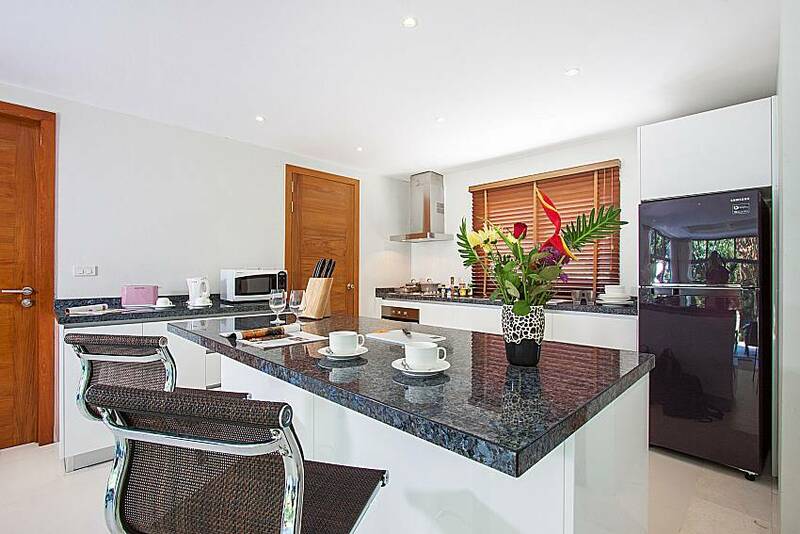 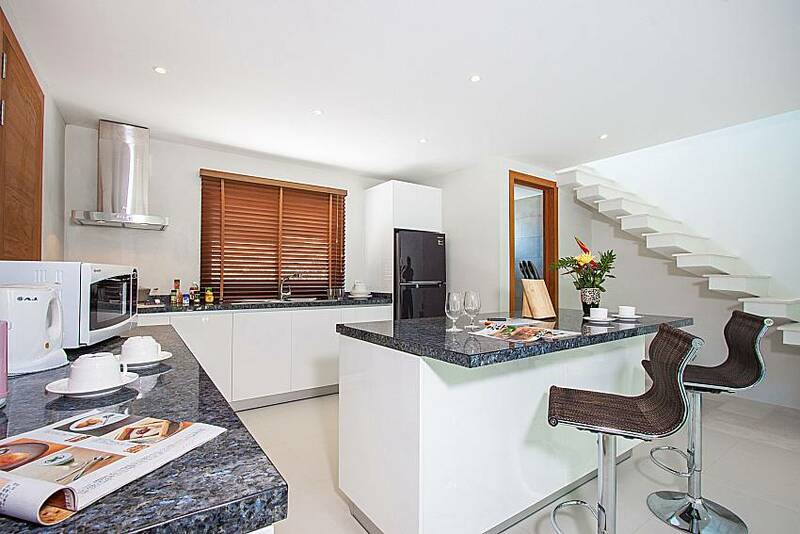 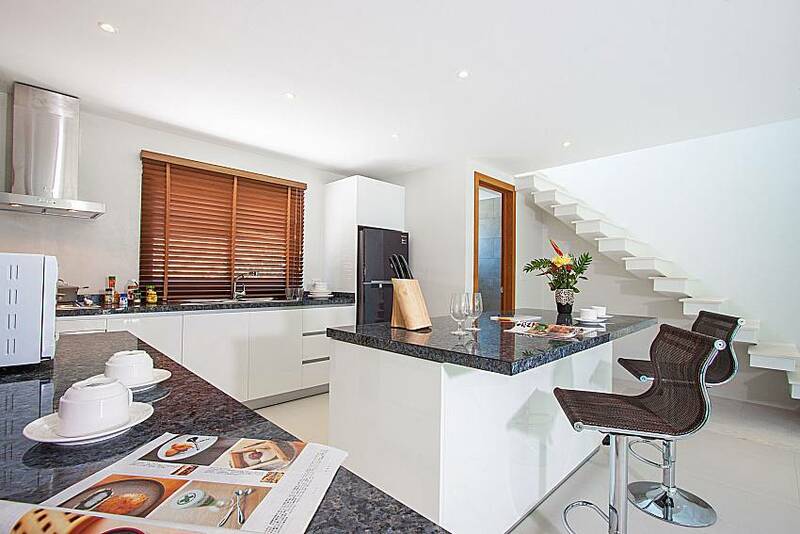 The modern kitchen is situated in the open plan living space at a higher level, coming with a breakfast bar and lots of modern appliances for self-catering. 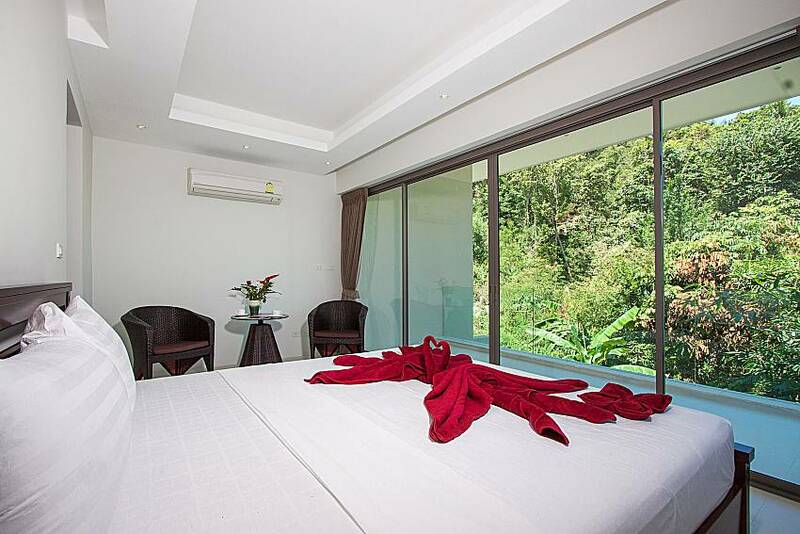 The 2 bedrooms sleep up to 4 people, coming with king-size beds, jungle views, air-conditioning and ensuite bathrooms. 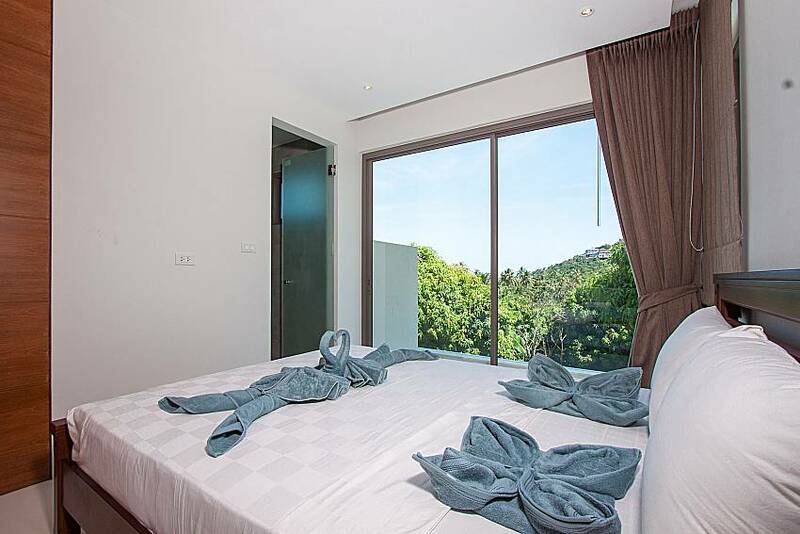 The villa is located in private grounds, surrounded by beautiful and luscious vegetation, just 1.5km from Maenam Beach on the north coast of Koh Samui. 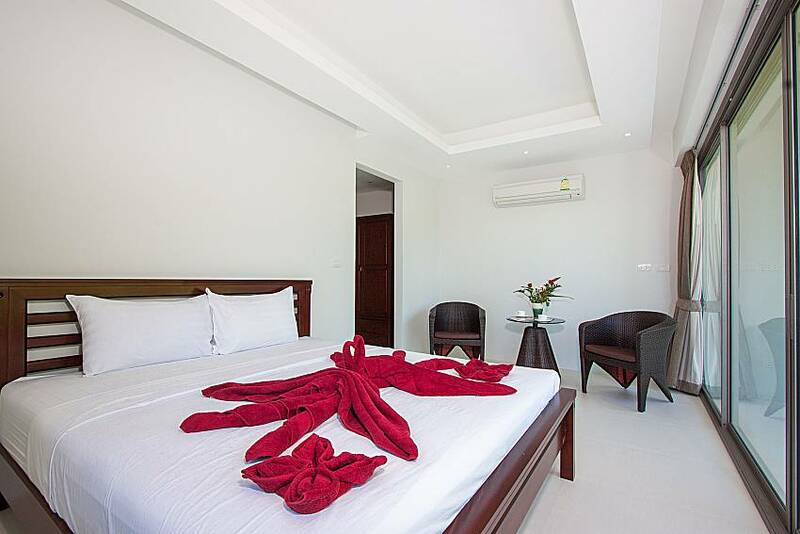 Bang Por Beach is also a similar distance away, and within 1.2km you can find restaurants, shops and spas, although the nightlife at Fisherman’s Village is 9.5km from the villa. 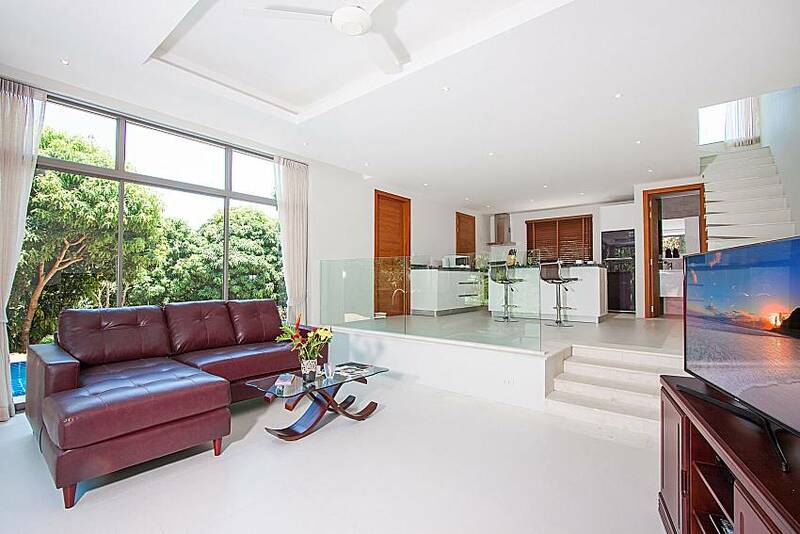 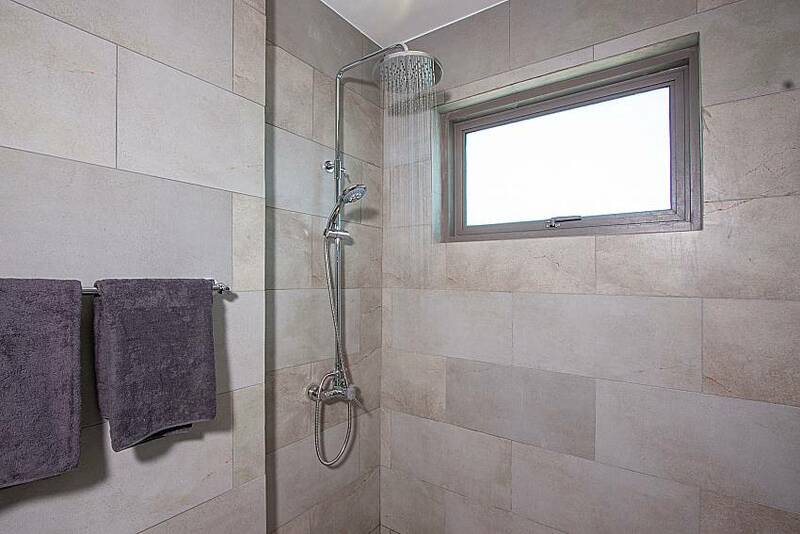 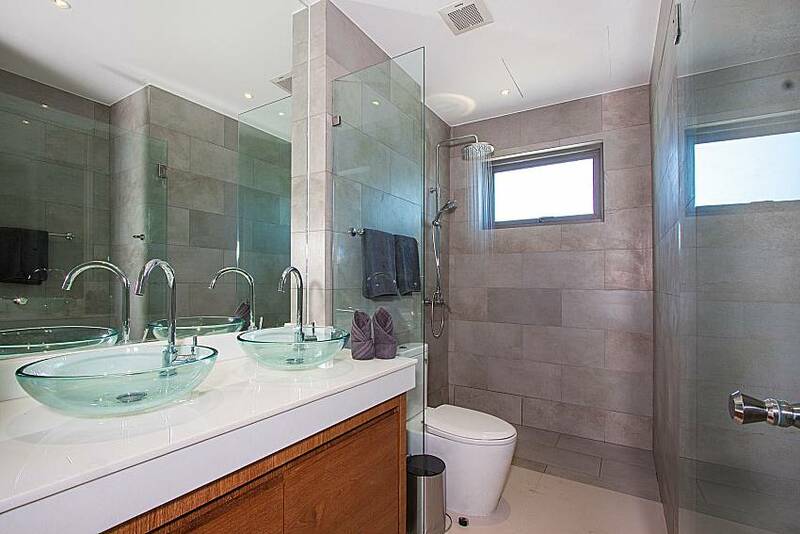 This is an extremely private location within close proximity of the beach. 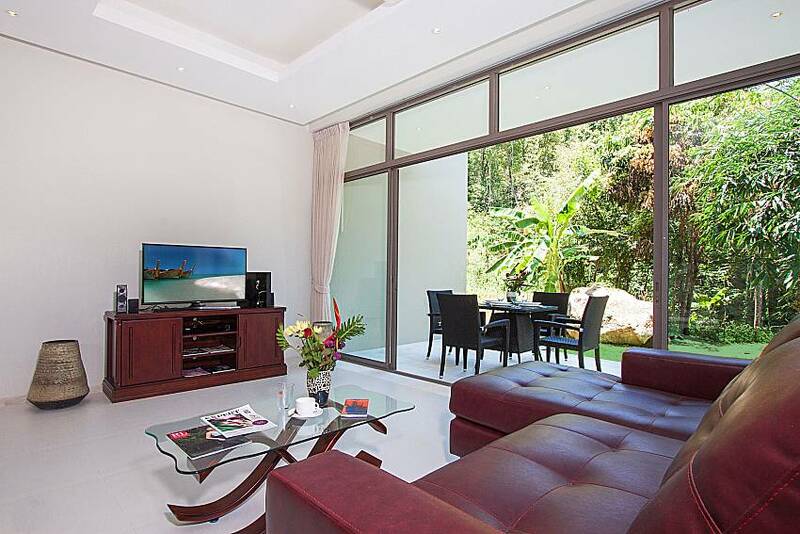 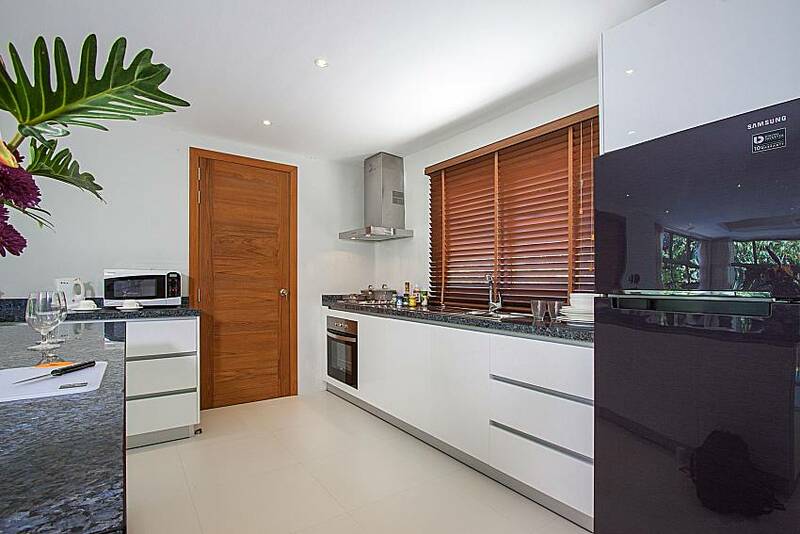 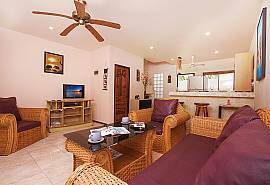 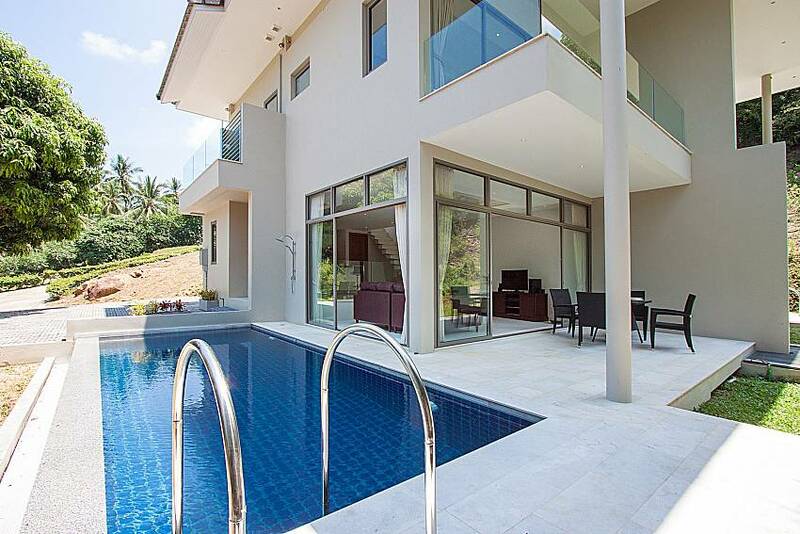 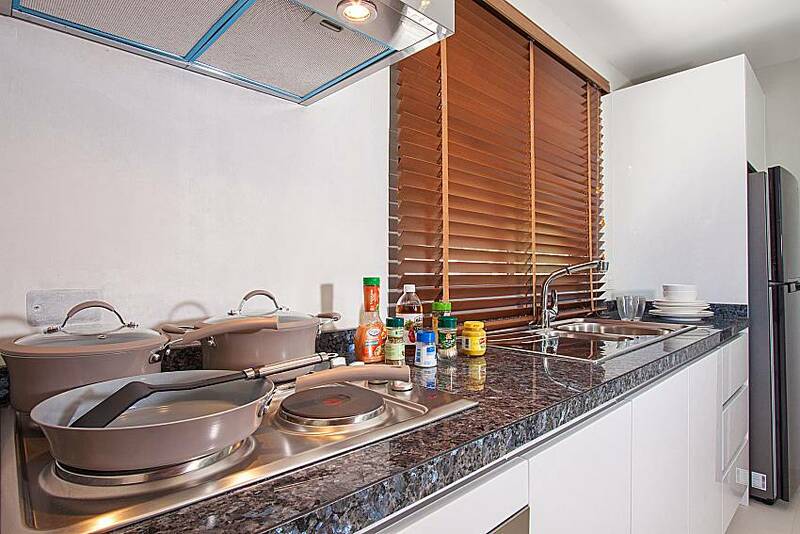 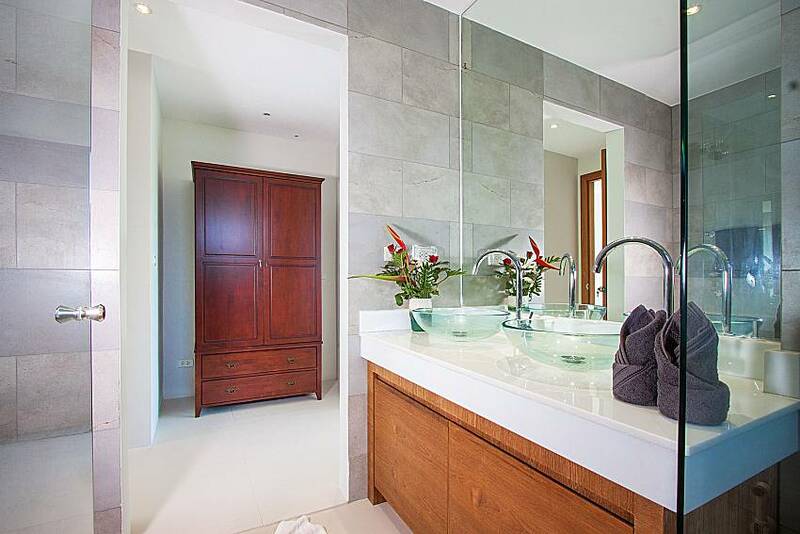 Check out our stylish villa rentals in Koh Samui.